Contents: Introduction to the Volume. Part I: Literacy Acquisition in Different Writing Systems. J. Pind, Evolution of an Alphabetic Writing System: The Case of Icelandic. B.E. Hagtvet, T. Helland, S-A.H. Lyster, Literacy Acquisition in Norwegian. C. Elbro, Literacy Acquisition in Danish: A Deep Orthography in Cross-Linguistic Light. H. Lyytinen, M. Aro, L. Holopainen, M. Leiwo, P. Lyytinen, A. Tolvanen, Children's Language Development and Reading Acquisition in a Highly Transparent Orthography. A. Lehtonen, Sources of Information Children Use in Learning to Spell: The Case of Finnish Geminates. J. Jaffré, M. Fayol, Orthography and Literacy in French. R. Job, F. Peressotti, C. Mulatti, The Acquisition of Literacy in Italian. K. Landerl, V. Thaler, Reading and Spelling Acquisition and Dyslexia in German. A.M.T. Bosman, S. de Graaff, M.A.R. Gijsel, Double Dutch: The Dutch Spelling System and Learning to Spell in Dutch. J.S. Sainz, Literacy Acquisition in Spanish. C. Cardoso-Martins, Beginning Reading Acquisition in Brazilian Portuguese. C.D. Porpodas, Literacy Acquisition in Greek: Research Review of the Role of Phonological and Cognitive Factors. T. Nunes, A. Aidinis, P. Bryant, The Acquisition of Written Morphology in Greek. A.Y. Durgunoglu, How Language Characteristics Influence Turkish Literacy Development. V. Csépe, Literacy Acquisition and Dyslexia in Hungarian. A.A. Reid, Developmental Dyslexia: Evidence From Polish. A. Janyan, E. Andonova, Word Reading in Bulgarian Children and Adults. I. Sprugevica, I. Paunina, T. Høien, Early Phonological Skill as a Predictor of Reading Acquisition in Latvian. E.L. Grigorenko, If John Were Ivan, Would He Fail in Reading? S. Abu-Rabia, H. Taha, Reading in Arabic Orthography: Characteristics, Research Findings, and Assessment. 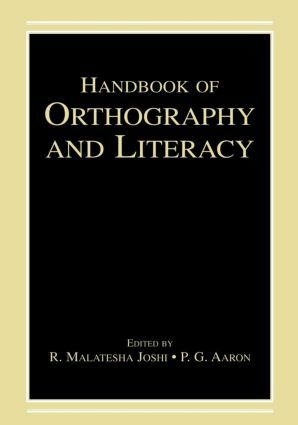 D. Ravid, Hebrew Orthography and Literacy. B. Baluch, Persian Orthography and Its Relation to Literacy. J. Kim, C. Davis, Literacy Acquisition in Korean Hangul: Investigating the Perceptual and Phonological Processing of Good and Poor Readers. P. Karanth, The Kagunita of Kannada--Learning to Read and Write an Indian Alphasyllabary. K.J. Alcock, Literacy in Kishwahili. H. Cheung, C. McBride-Chang, B. Wing-Yin Chow, Reading Chinese. Part II: Literacy Acquisition From Cross-Linguistic Perspectives. P.H.K. Seymour, Theoretical Framework for Beginning Reading in Different Orthographies. U. Goswami, Orthography, Phonology, and Reading Development: A Cross-Linguistic Perspective. N. Akamatsu, Literacy Acquisition in Japanese-English Bilinguals. M. Caravolas, Learning to Spell in Different Languages: How Orthographic Variables Might Affect Early Literacy. K. Landerl, Reading Acquisition in Different Orthographies: Evidence From Direct Comparisons. M. Aro, Learning to Read: The Effect of Orthography. P.G. Aaron, R.M. Joshi, Learning to Spell From Print and Learning to Spell From Speech: A Study of Spelling of Children Who Speak Tamil, a Dravidian Language. R.M. Joshi, T. Høien, X. Feng, R. Chengappa, R. Boulware-Gooden, Learning to Spell by Ear and by Eye: A Cross-Linguistic Comparison. Part III: Literacy Acquisition: Instructional Perspectives. R. Treiman, Knowledge About Letters as a Foundation for Reading and Spelling. P. Bryant, H. Deacon, T. Nunes, Morphology and Spelling: What Have Morphemes to Do With Spelling? W.E. Tunmer, J.W. Chapman, Metalinguistic Abilities, Phonological Recoding Skill, and the Use of Context in Beginning Reading Development: A Longitudinal Study. T. Nicholson, G.L. Ng, The Case for Teaching Phonemic Awareness and Simple Phonics to Preschoolers. L.C. Ehri, Alphabetics Instruction Helps Students Learn to Read. R.S. Johnston, J.E. Watson, The Effectiveness of Synthetic Phonics Teaching in Developing Reading and Spelling Skills in English-Speaking Boys and Girls. R.K. Olson, Genetic?? and Environmental Influences on the Development of Reading and Related Cognitive Skills. D. Aram, O. Korat, I. Levin, Maternal Mediation in a Young Child's Writing Activity: A Sociocultural Perspective. R.L. Venezky, Foundations for Studying Basic Processes in Reading.